An exhibition devoted to reading has opened at the Pushkin Literature Museum. 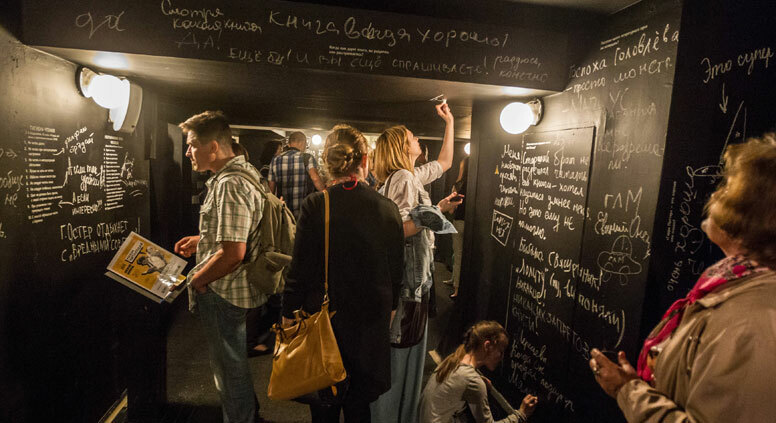 Russia that Reads, one of the most important exhibitions of the Year of Literature, opened at the Pushkin Literature Museum on the writer’s birthday, June 6. The exhibition’s main subject is Homo legens: Reading man. How have readers’ views of authorship changed over the ages? Which writers used to be famous but are now forgotten? Which literature is read in prison? What notes did admirers leave at Sergei Yesenin’s grave? The exhibition answers these questions and more. “If I asked everyone here what their blood type is, I would get a range of answers, but I’m sure that everyone here has one thing in common: a love of Russian literature, Alexander Pushkin and his works runs through their blood,” said the Mikhail Seslavinsky, the head of the Federal Agency for Press and Mass Communications, at the exhibition’s opening ceremony. Russia that Reads is an interactive literary labyrinth. There is a section for cult books from different generations: during Perestorika (1987 - early 1990s) people read Faithful Ruslan by Georgy Vladimov, It's me, Eddie by Eduard Limonov, We by Yevgeny Zamyatin, as well as books by Dovlatov, Platonov, Nabokov and Astafiev. There is also a section devoted to censorship, a display stand of serious literary journals, a collection of sketches and covers from Silver Age editions, and portraits and cartoons of writers. One room is completely devoted to reading during the Second World War. In the Promoting Reading section you can see 1920s posters with instructive slogans exhorting citizens that reading is a way to become a good communist and so on. In the Resonant Literature room you can hear Bella Akhmadulina, Yevgeny Yevtushenko and other figures from the ’60s speaking. A metro carriage has also been recreated so you can sit and read a book – the best companion for any journey. In essence, Russia that Reads is a mini-projection of what should be the main exhibition at the country’s principle literature museum – an exhibition that still doesn’t have a permanent space. Somewhere that 16th-century editions are put next to e-readers, where the history of literature, publishing and reading from its very origins to the present day is shown, where readers from different generations can meet. If you love reading, you can visit the exhibition until November 15 at the Alexander Pushkin State Museum (Prechistenka 12/2) – not to be confused with The Pushkin State Museum for Fine Arts.